Burton are set to put 50-year-old keeper Kevin Poole on the bench as boss Gary Rowett looks for a loan solution. Poole will be cover for Dean Lyness against Mansfield on Tuesday after on-loan goalkeeper Jordan Pickford was recalled by Sunderland last week. 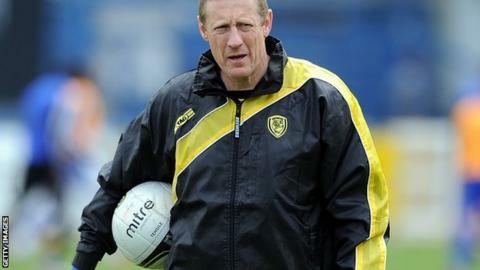 Brewers goalkeeping coach Poole was the Football League's oldest registered player when he 'retired' at 48 in 2012. Kevin Poole came through the youth ranks at Aston Villa - the team he followed as a boy - and he made his debut in 1984 in a 2-0 win against Tottenham. One of Poole's early goalkeeping coaches was England's 1966 World Cup-winning goalkeeper Gordon Banks. He went on to play for Middlesbrough, Leicester City, Birmingham City, Bolton and Derby County. "Obviously that is not something we want to do long term," Rowett told BBC Radio Derby. "I said to Pooley at the start of the season that if we have to do it for one game, if it saves us wasting money on a loan keeper for a month, then it makes sense for me to do it. "If we had brought someone in for a month before the game on Saturday [against Bristol Rovers] we would have found mid-window, when we can't bring anyone in, that we would have lost someone to their parent club and we would have been left without a keeper again." Poole was first convinced to put the gloves back on in October when Lyness was injured. Now that Pickford has been recalled by the Black Cats and unlikely to return to the Pirelli Stadium before the loan window closes on Thursday, Rowett is searching for yet another solution to the Brewers' goalkeeping situation. "I think it is poignant to give Deano the chance for the two games, so let's put Pooley on the bench and make a decision before Thursday," Rowett said. "We will have to bring a keeper in. The decision really is do we bring in a first-choice keeper to compete with Dean for that jersey or do we go for someone as cover? "We had to make the decision to bring in Jordan in the first place when Dean hasn't done an awful lot wrong at times. We know he is a terrific goalkeeper, but there are just one or two aspects of his game that we want to improve before he gets a run of 20-30 games. "He knows that and I think he accepts that, so we have a decision to make."